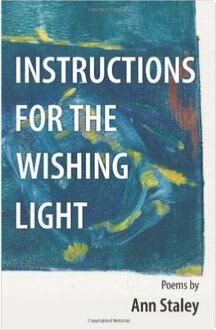 Poems from the heart of a writer I know -- reading “Instructions for the Wishing Light” is to learn again: what matters and why. Casually narrative poems, this collection polishes the gems of experiences from a lifetime. Ann Staley’s perspective strikes me as reminiscences from the long view; an inventory of things most treasured, from a life astutely lived. This collection explores the heartbreaking intimacy of the word; the creation of a community of readers, writers, ponderers and knowers. I learned again that the identification with place—anywhere, any time, is what makes one at home in the world. Ann’s narratives in poetry, read true to a life lived open to the world, open-hearted and vulnerable. Here is the work of a modern poet who has the sensibility of a Romantic—in the classic sense of favoring the natural order of the seasons and personal knowing over logic, intuition over reason. She has life lived on the road and at the hearth, recounting experiences which have seasoned her soul, like a stone worn smooth in the river of life. Ann Staley reaches that place with her words that can’t easily be accessed in talk; some intimacies are known only in stillness. Some of her poems are crystal—clear as a Vermeer still life, true to a memory captured in a moment.